CIOs and CEOs of large enterprises are faced with an overwhelming demand to transform their IT enterprise services and with a bewildering, often conflicting landscape of advice. IBM has transformed itself many times since its inception in the late 19th century and is on a continuous journey of innovation and transformation to help clients win in their ever-changing markets. Listen to Angelia Herrin, Editor of Special Projects for HBR, interview IBM’s Max De Ycaza, Director of Technology Innovation & Transformation, about how IBM’s largest business unit, the $40 billion Global Technology Services unit, is helping clients transform their IT enterprise services by leveraging the agile for services operating model. Welcome to the HBR Quick Take. I’m Angelia Herrin, editor for special projects and research at HBR. Today, CIOs and CEOs of large companies are faced with an overwhelming demand for digital transformation and a bewildering, often conflicting landscape of advice. IBM has transformed itself many times since its inception as a weights and scales company in the late 19th century and most recently embarked on a digital transformation of their own. Today, we’ll talk with IBM’s Max De Ycaza about how IBM’s largest business unit, the $40 billion Global Technology Services unit, is helping clients learn from this journey. Max, thanks for joining us today. Happy to be here, Angelia. As you work with clients around the world, you know that digital transformation is on every leader’s mind. But what are the challenges that IT leaders are encountering as they try to keep pace and try to transform process and operations while the business is evolving? Let me tell you, our large enterprise clients’ processes are highly dependent upon software. We know that the pace of change around software is lightning-fast. Driving digital transformation really means driving rapid, efficient, and high-ROI responses to those changes. Where our clients struggle and where we see challenges is not in the area of new product development. Standard agile approaches like Scrum and SAFe work pretty well for that. Where we see greater opportunities for improvement is on the less-talked-about but absolutely critical back-office services functions, especially IT operations, infrastructure, and maintenance. It sounds great to simply spin up a new server with a button push on the cloud, but that doesn’t really always provide the security, functionality, or long-term maintenance that most big firms really need. Transformation born in the product world typically hits the wall when it comes to critical productions and infrastructure. What I witness is that two-speed IT doesn’t work. IT must respond as quickly as the rest of the organization. Why? Because large enterprises’ business operations live in software. Successful digital transformation means being able to change business operations software, commonly called IT services, quickly, reliably, and efficiently. Spinning up an on-demand server in the cloud is not the same as building a security-hardened, permission-enabled asset track server loaded with the client’s applications and data. In the past couple of years, IBM Global Technology Services undertook its own agile transformation. How did you attack this transformation, and how has that impacted the whole organization? This was a large, massive-scale transformation with over 110,000 employees globally. IBM GTS does project work too, but most of our work is daily IT services, support, and infrastructure that run the businesses for thousands of the world’s biggest companies. Some of our clients may receive 90,000 support tickets per month. We tried Scrum and SAFe with limited success and even looked outside IBM for best practices. I interviewed the leaders of many fabled Scrum companies, agile certification firms, and some Big 4 consultants, but the advice we got was all product-focused. We created a fit-for-purpose approach that works for both projects and high-volume, high-availability environments. As IBM worked with agile principles internally, you also extended the practice to working with clients. Can you talk a little about the development of agile for services and what that means to customers? As we figured this stuff out the hard way, our clients noticed. They had been hitting the same roadblocks with their own agile approaches. They started asking us, “How do you do that? Will you show us how to do it within my own organization and culture?” I have a very small global team of experts, not mid-level consultants. We kept our team very lean but highly expert. When we engage with clients, it’s not a long-term engagement billing by the hour. We involve three flat-fee, fixed-length engagement options that allow our customers to get fast business outcomes and transactions within their own culture and constraints. Then they decide if they have learned enough to continue on their own, or with a bit of additional guidance from us, or with a large-scale rollout. 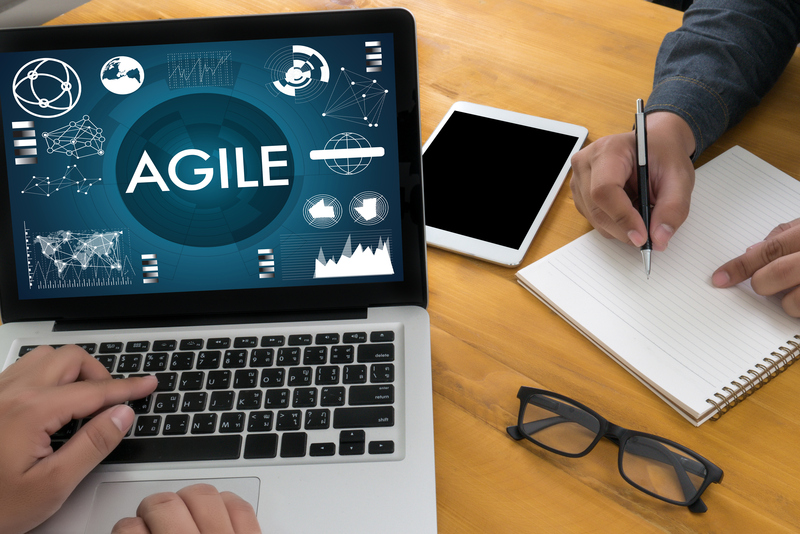 The agile model has been around for a while in software development, and the benefits there are clear. But in working with clients around the world, what are the challenges you see as IT leaders try to adapt this to improving IT operations and services? How should leaders think about working this transformation? I think taxonomy is a problem. The terms digital transformation, agile, and DevOps are highly overloaded. We keep it simple. Let me take digital transformation. It’s mainly about automating manual processes and moving to the web. Let’s take banking, for example. Depositing checks used to require you to physically go to the bank and wait in line for a teller. Now you can snap a picture of the check on your smartphone and deposit it via an app. That’s a digitally transformed process. Then you go to agile transformation, and that’s about changing the way people work to develop and deliver apps like the banking app we just talked about. Then, if you looked at that, you say, “Hey, then what is agile for services?” This is what my team here at IBM does. It’s about changing the way people work to deploy, support, and maintain apps like the banking app we just talked about earlier. Thousands of other mission-critical apps run the business processes in the bank. Finally, this is the big one, DevOps, which is often used interchangeably with Scrum or agile product development—but those are not the same thing. DevOps means that you have created an end-to-end ecosystem where developers and even maintenance and IT support code changes and deploy autonomously, confidently, and—ideally—instantly with high quality and traceability. I think we’ll all agree that maybe Netflix might be the best example today. It’s really the nirvana state of an agile company, and very few players ever get there. The closer you get, the better off you are. That’s what we help our clients do. Max, thanks so much for talking with us today. If you want to read the white paper by Harvard Business Review Analytic Services, The New, Lean, Agile Face of Business, which was sponsored by IBM, you can find it at hbr.org. Thanks for listening to the HBR Quick Take. To read the Harvard Business Review Analytics Services paper sponsored by IBM, click here.